"Dream Logic," like its villain, had a bit of a Jekyll and Hyde problem. There were some very good parts, mostly involving the waking nightmare sequences and Olivia's business card therapy, but other parts that didn't make a lot of sense, even by the dream logic that "Fringe" tends to apply to its own plots. I didn't buy Olivia's explanation for the dream doc's split personality, and the whole business with Walter drugging Keith Dudemeister(*) to experiment on him and no one - including Astrid, who's allegedly an FBI agent - doing anything about it either during or after the fact was just silly. (*) That's a "Scrubs" reference, for the confused. 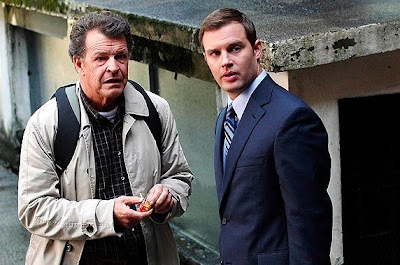 But as standalone "Fringe" episodes go, it was gripping enough, and the glimpse of Peter's abduction from Earth-WTC suggested some intense stuff is going to go down once Peter stumbles across the truth about his "father." I thought the parts of the episode dealing with the case of the week were extremely slow. However, I loved the Olivia storyline and especially the glimpse of Peter's abduction/dream. Walter sitting there watching Peter dream was chilling. Creepy and sad at the same time. I can't wait to see how Peter finds out and how he will react knowing he's in the "wrong" world. What is the new banner? I don't know any of these people. The third girl played Sookie's brother's girlfriend on True Blood, I think, but the rest are a blank. Fringe was dull. I am getting tired of Bowling Yoda and his wacky therapies. The business card thing was really stupid. I hope Olivia gets into her new powers some more. I was a little confused by the reveal of the doc as well. So he left a threatening note for himself? Was this a split personality? I don't get it. That was just weird to me. I thought the 'secret message' was odd...maybe b/c of the use of 'gonna.' It sounded like the spelling a teenager would use. Maybe that's just the English major in me. Loved the bad dream that Peter had at the end. That, in my opinion, was the best part of the whole episode. rosseau- the new banner is women who were on Freaks and Geeks, pictured in their most recent roles. Ah! Thanks M. I never got into Freaks and Geeks for some reason, maybe because it aired too close to when I graduated high school. I'm warming up to the whole series. Anna Torv doesn't irk me as much anymore, it looks gorgeous, and I'm a sap for Abrams's brand of sentimentalism. The problem I have with these standalone episodes is that the conclusion of the story's all seem the same. Every week its "a large group of people narrowly avoids disaster". If the endings to the standalone problems were better it could go from being merely a good show to a great one imo. It still has enough bits hinting at the overall mythology to keep me coming back though, like the scene at the end with Walter and his son(beautifully played by John Noble). Anyone else spot the Observer at the Dr.'s office about halfway thru the episode? When Peter remembers the contents of his dream (The Poster) the jig will be up. The monster of the week(MOTW) episodes are always a let down for me. Much prefer ones that deal with the overarching series mythology. Peter's scene at the end hints of the confrontation to come. That reveal is my most anticipated moment of the series. Dude, Olivia's random collection of cards and old letters *perfectly* spelling out Charlie's "you're gonna be fine" makes more sense to you than a well known story of Dr. Hekyll and Mr. Hyde (and definitely something addicts do, not to mention abusers) doesn't? WTH. Anyways, I'm betting Walter *did* get it for what he did to the Dudemeister: when_Peter_found_out. Which is what I'm betting Astrid was waiting for. No one can punish Walter like Peter can. I'm sure Walter didn't get his blueberry waffles *that* night. In the context of a show about science-fiction phenomena, the card trick absolutely comes across as more plausible as a Jekyll and Hyde situation that extreme. The sci-fi stuff is the buy-in the audience willing suspends its disbelief for, and for it to work, the more earthbound parts of the show have to make sense. If you'll recall season 1, even very early on there are references to Walter watching Peter sleep "to make sure he's breathing" (or something like that). So now we actually have much greater insight into that: Anytime that Peter dreams, there's a chance he could remember what happened, and Walter is deathly afraid of that. And it's been quite obvious to me since late Season 1 that the Big Bad waging war against our world is Walter's counterpart in Earth-WTC. I can't wait to see Noble play a Walter who is cogent and driven by intense vengeance. "...the whole business with Walter drugging Keith Dudemeister(*) to experiment on him and no one - including Astrid, who's allegedly an FBI agent - doing anything about it either during or after the fact was just silly." Actually its an action they cannot come back from. How is what he did to the agent any different than what Loeb and Jones did to Olivia with the spinal tap? They were just testing her, not hurting her...oh but right they knocked her out and did it against her will, just like Walter did to the agent. Aside from jail time for Walter I'm not sure how they're going to get past this. On top of that they've now revealed him to be a kidnapper. The character is done. I'm assuming its only a matter of time before wrathful Walter from Earth-WTC becomes the main focus. I disagree with Frank. Walter's experiment on the FBI agent saved the day and it did not appear to harm the agent. Dudemeister had a few dreams stolen from him, big deal. He'll be fine. The FBI allows Walter to get away with all sorts of illegal and unethical shenanigans because he's helping protect Earth from Earth-WTC. Its a small price to pay. He has also attacked and drugged Agent Farnsworth against her will last season. She forgave him. They got past that and they will get past this. As I see it this is one the major themes of this show: protecting the world, but at what cost? Its one of the things that makes Walter's character so compelling, his willingness to do anything to anyone in the pursuit of the knowledge he needs to fight the larger battles. No, dammit! I always miss him! I have to remember not to delete "Fringe" from the DVR until I've read all the comments here. I agree with others above that the best part of the ep was Peter's dream. Poor Peter...and poor Walter. No wonder he's so damn messed up.